The output stage of tube amplifiers must be set at a correct DC bias current. Many smaller amplifiers have an automatic biasing circuit - the so called cathode bias. This is very convenient as you can change the output tubes easily; you don't have to readjust the bias current, just plug in the tubes and play! For bigger amplifiers, this method has a serious backdraw: this cathode bias circuit dissipates a lot of power. Therefore, the so called 'fixed bias' is used. The DC bias current through the output tubes is set by adjusting a DC voltage on the grid. For correct adjustment of the fixed bias, several methods are commonly used but they all have their backdraws: you either have to install current sensing resistors or need special equipment like an oscilloscope or bias tools like the TAD Bias Master or you have to do dangerous stuff: measuring the DC voltage drop on the HV through the output transformer. In this tutorial, 2 very simple, save and affordable methods are explained: DC bias using a wall plug energy meter and usage of an IR thermometer. These 2 methods are complimentary as the energy meter gives instant, absolute readings and the IR thermometer gives readings for individual tubes. This is ultimately simple: let the output tubes warm up and point an IR thermometer at the tubes to have an individual reading of the tube temperatures. This will tell you if the tubes are all biased at approximately the same value. However, don't take this as an absolute reading: the IR thermometer measures in the infrared (typically 8 to 14um wavelength) which means you're reading the temperature of the glass surface rather than the plate temperature. Furthermore, you should correct for the emissivity factor of the material - glass in this case. This is a bit of a guess. Nevertheless, it's a very fast, simple and usable method, especially in combination with the energy meter methord that is described below. You might also want to check Vacuum Tube Plate Temperature vs Performance In Audio Power Output Tubes, a demo by ElPaso who is using this method as well. 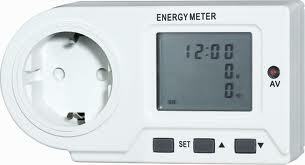 This Alecto EM-16 measures the wall plug voltage, current and power dissipation. You can also use it to measure these over a certain time. It will typically show properties like the average power over time, the peak power, the total measurement time etc.. For our DC biasing method we only use one property: the (instant) power dissipation. I got the idea for the DC bias method as described here from TEST PROCEDURE FOR 400 P.S. : this describes how to adjust the legendary Fender 400-PS bass amplifier. It describes how to use a current meter on the primary winding of the power transformer of the 400-PS to check/adjust the DC bias. By now, you have 4 measurements, let's call these , ,  and . Now determine the average power per output tube by dividing this by the number of output tubes. That's it! Next, you check the specs of your output tubes to determine power dissipation you want for every output tube. For instance, an EL34 can typically handle a plate dissipation of 25 Watts. The screen grid dissipation is about 8 Watts so in total you can dissipate 33 Watts. If your amp is operated in fixed bias class AB mode you want to set the DC bias such that the dissipation at rest is quite a bit lower. 15 Watts is really safe, 20 Watts is probably still fine. To be on the safe side, turn the DC bias pot to the coldest bias and now change from standby to operate mode to adjust the real  to [4desired] as you just calculated. Once you have measured ,  and , you can always check the DC bias again by measuring  and do the calculation. In this way, you can keep an eye on the DC bias over the lifetime of the output tubes without having to open the amplifier. In fact, this is a very usable tool for every owner of a fixed bias tube amp as it hardly requires any skills or effort! For safety reasons it might be wise to check your energy meter DC bias method the first time you use it: I did this by measuring the DC bias of an amplifier with one Tonefactory Bias Probe per tube and compare the results with my energy meter. The results were the same within 1W which is the resolution of the energy meter anyway. Most methods to measure the DC bias of the power tubes will measure the combined value of plate current(s) plus screen grid current(s). All methods that measure cathode current are measuring combined plate and screen grid currents as both these currents flow through the cathode as well. If you measure the DC voltage drop across the output transformers primary (center tap to top or bottom tap) and divide this by the resistance of that winding you generally measure plate current only; the screen grid current is not flowing through the output transformers primary winding unless you have a triode mode output stage or ultralinear taps. Of course, you can argue which method is best and in theory you would like to know the separate values for the plate and the screen grid current of each tube. In practical situations however, it's generally good enough to measure the combined dissipation of both plate and screen grid of all the output tubes together. As long as you have a matched power tube set, the differences between the individual tubes are small enough and there is generally just one DC adjustment voltage anyway for setting the DC bias of all tubes. 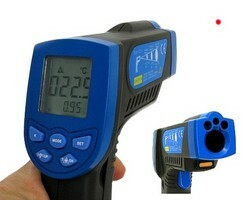 If there's anything wrong with a particular tube or socket, the IR thermometer will detect it. When you install new power output tubes, it's generally a good idea to use a function generator and oscilloscope anyway, as this is the preferred method to measure the ac balance of the power amp; With this equipment you can check if saturation of the positive and negative excursion of a sine wave occurs symmetrically. If this balance is good, it means that probably your output tubes are matched close enough. Of course you could have the situation where the phase splitter is unbalanced and the output tubes are unbalanced as well and these 2 effects happen to correct each other so the clipping is still symmetrical but this chance is pretty low. You could also swap the places of the output tubes to be sure that they are really matched. The Alecto EM-16 energy meter I used measures the real dissipated power so even if the amplifier draws substantial blind current, the energy meter will not take it into account. This is what you need as the blind current will not add to any current that flows through the tubes. Of course I can't guarantee that all energy meters will measure real dissipated power but if you want to be sure you might want to use an energy meter that measures and displays the cos(phi) factor as well. The Brennenstuhl PM231E is a nice example of such a meter. According to the datasheet it has a good accuracy: 1% or +/-0.2W. Idea's and comments are welcome!